When your pet needs care, we’re here to help. 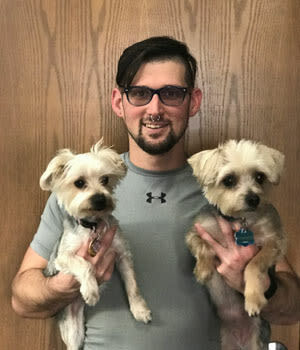 Animal Medical Clinic of Merle Hay is staffed by a team of nurturing professionals, committed to the health and wellness of animals in Des Moines. We are dedicated providers of wellness care, preventative medicine, internal medicine, and more. 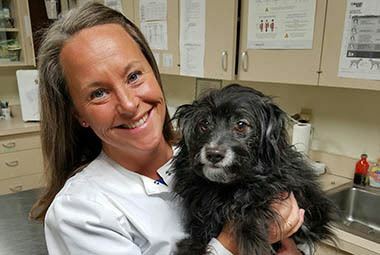 Tracy began working at the Veterinary Medical Group in 2007 as a Veterinary Assistant. She took a year off in 2016 to pursue her other interest of fitness. In March 2017 she came back to the clinics in the Practice Manager role. Tracy has a bachelor’s degree in animal science from Iowa State University. Tracy lives on a farm with her 4 dogs. Trevor is a Rottweiler mix, Ellie is a Mastiff, Cora is a Great Dane, and Trixie is a Jack Russell Terrier. They also have 3 cats, two horses, 2 mini ponies, and a small herd of goats! Needless to say her and her children are animal lovers! When she isn’t attending to her animals, Tracy enjoys working out at her gym and watching movies with her family. Kim began working with us on Valentine’s day in 1993. She loves to interact with clients and enjoys surgeries. She has 5 animals of her own including a Pointer Mix, Buster, a Sheepdog, Jack, a Jack Russell Terrier, Ming, a Chihuahua, Khloe, and a Domestic Shorthair cat, Roxie. She, her husband Huy, and her children Devin, Christopher and Kyle enjoy vacationing to swim in the ocean and spend time in the sun. She enjoys spending time in her vegetable garden and her numerous flower gardens. Erin is originally from Omaha, Nebraska, “Go Big Red!”. She studied at the University of Nebraska in Omaha and moved to Iowa in 2005. She began working with us in 2008 as a Veterinary Assistant and she absolutely loves her job. She and her husband, Dan, have 3 fur kids. They include Moose, a 5 year old Brittany, Max, an 11 year old Shih Tzu and Raymie, an 8 year old Shih Tzu. Her interests outside of work are enjoying sports and redoing old furniture. 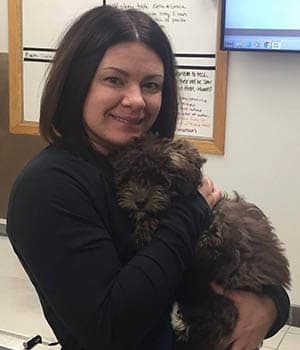 Sarah has been a Veterinary Assistant at the Veterinary Medical Group of Des Moines since 2013. 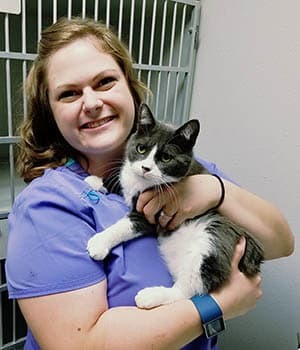 She has a bachelor’s in Animal Science from Iowa State University, and is currently pursuing a degree in Veterinary Technology from the DMACC to become a Registered Veterinary Technician. Through work she has learned she is very interested in client education and surgery. Sarah and her husband have two cats (with a plan for more pets! ); Rosie is 9 years old and Sterling Mallory Archer (or “Archer” for short) is 6 months old. In her free time, Sarah enjoys reading, coloring, and playing video games. 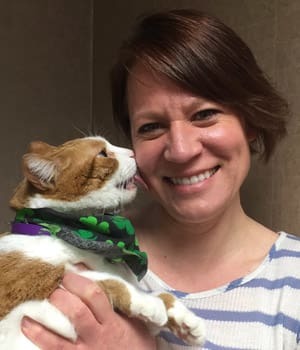 Staci started working with us as a Veterinary Assistant in November, 2015. She graduated Iowa State University with her Bachelor’s degree in Animal Science. She is highly interested in surgery and internal medicine. She has 2 dogs and one cat. Her cat is a domestic medium hair named “Stella” and her two dogs include Luminaught and Rocco, both Siberian Huskies. Her interests outside of work include cooking, golfing and bike rides. Megan started working with us in June, 2016. 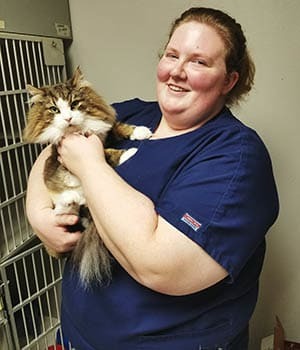 She received her Associates degree in Veterinary Technology from DMACC in May of 2016. 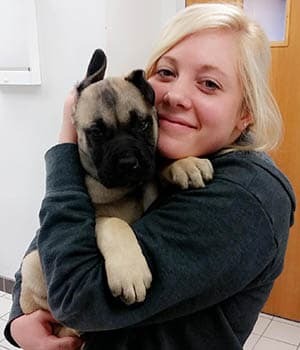 While working with us she has formed an interest in animal nutrition and laboratory work. When not working at the clinic, she enjoys spending time with friends and family, watching home improvement show, and cooking. Hi! I am Christopher-Michael. A little about myself: I like sunset walks on the beach. I enjoy hiking with my puppy, Gabe. I’m very passionate about grooming. I make sure my clients are taken great care of. I want every one of my clients to leave my care happier than they walked in. I hope to see everyone again and again, over and over!